This is a pitcher plant. There are many varieties, this one is my favorite. 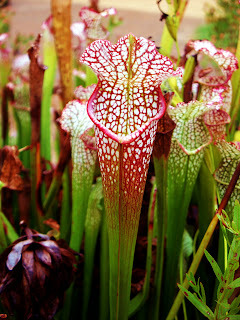 Don't ask me it's name, botany was not my specialty. 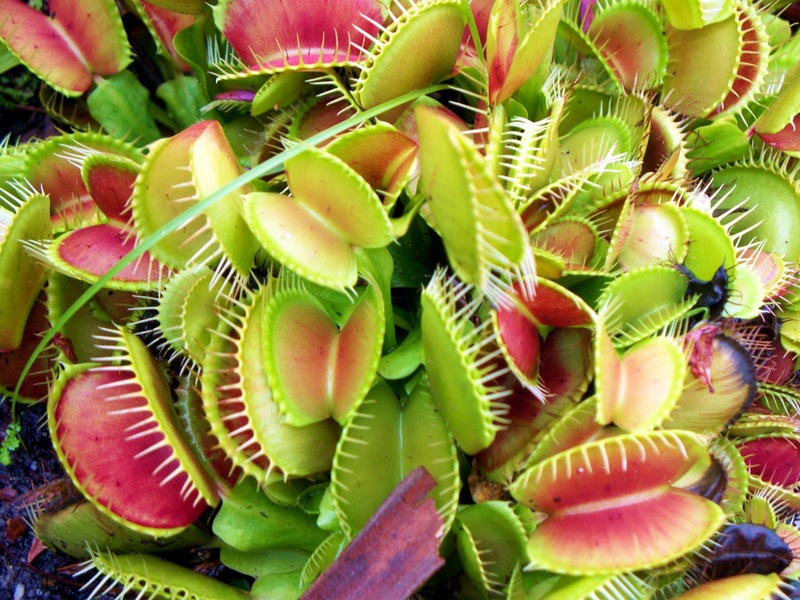 They are carnivorous cousins to the venus fly trap, both of which live in NC. In the wild. 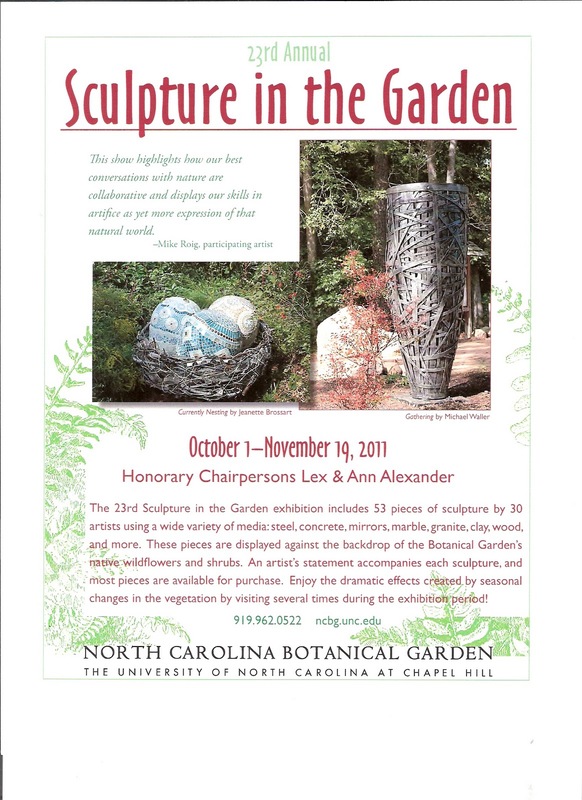 And at the North Carolina Botanical Gardens. Bugs crawl in, but they don't crawl out. 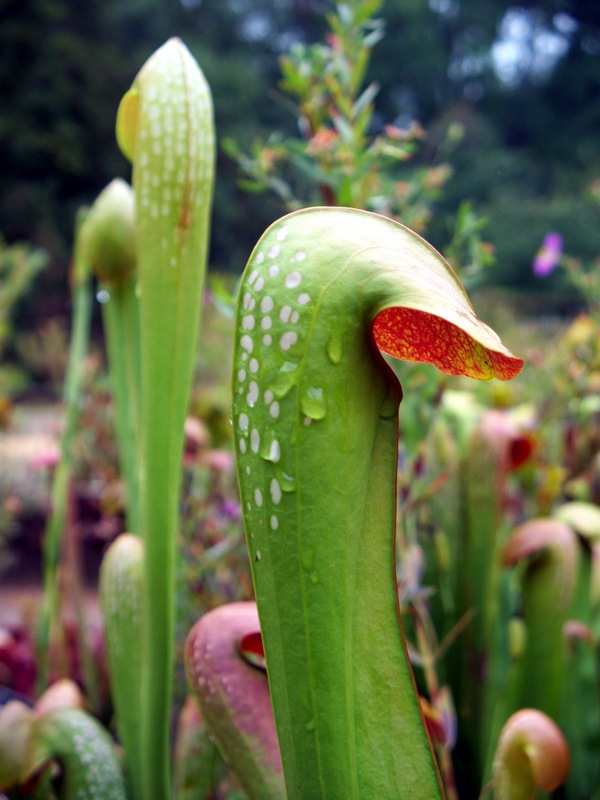 I'm sure one of the friendly staff or volunteers at the gardens would be happy to tell you more about these really fascinating creatures (plants). I just love looking at them. They are beautiful this time of year. Soon, the chilly nights will turn them brown, but they'll spring anew next year in the swampy coastal plains of Eastern NC. And at the NCBG, ready to eat more bugs. I admit, I'm a bit of a weather wimp. I don't like sitting at soccer games soaking wet (although I do). I don't drive on wintery days (especially on a school cancelled "snow day"). Extreme humidity with heat makes me cranky (and sweaty). Really it's one of the main reasons I don't usually participate in craft festivals. From artist friends I've heard horror stories of blown over tents, art being ruined, sweltering heat, slow crowds on bad weather days. That just seems like a tough gig. But today is a different story. I've got an exterior mosaic installation to do this week. Not just plopping down a finished, sealed mosaic sculpture (like Friday in the misty, mosquitoey coastal plain, aka swamp habitiat at NC Botanical Garden). This one is a 16 sq ft mosaic at a park, requiring onsite mixing thinset cement, carefully piecing the sections to fit, mixing and applying grout, sealing... rain is not a welcome factor. I love that word. Andamento. It sounds smooth and mysterious. It refers to the way the pieces of a mosaic flow and create movement and rhythm. It is what helps your eye read the pieces and interpret color, spacing, shape, texture, size. It's detailed and specific, yet gives you an overview. The beginning and ending aren't really so important, just everything in between.